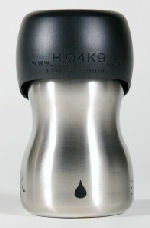 H2O4K9™ is the first stainless steel water bottle specifically designed to let dogs drink naturally. Perfect for the park, walks, hikes, bike rides, tracking, search & rescue, camping, vacations, beach, dog shows, and for use in your car. Provides fresh clean water 100% free of any estrogenic-activity (EA) chemicals including BPA and Phthalates. With an H2O4K9 bottle the lid is the bowl, designed to let your dog drink naturally. Portable, easy safe and sanitary for your dog anytime. Standard size bottle fits cup holders, bike cages, backpacks etc. 18/8, food-grade stainless steel bottles. No worries about BPA, phthalates or other harmful chemicals. No more searching for water. No more cupping of the hands.